Self-shielded flux-cored arc welding (FCAW-S) is one of the core processes you’ll learn in a welding program, and it has many advantages over the other major types of welding. FCAW has a high production rate because the equipment set up is the same as for MIG welding, but the two processes shield the electrode from atmospheric contaminants differently. While MIG relies on a shielding gas, the wire electrode in FCAW-S is packed with flux in the center, which protects the work as it burns (there is a gas-shielded FCAW process, too, which is called FCAW-G). This makes FCAW-S a great process for outdoor projects. Despite all of its benefits, problems can still occur with FCAW-S. The good news is, we’ve outlined how you can avoid 6 especially common FCAW-S welding defects in this post. Perfection is a rare quality in most fields, including welding. Many welds have some flawed metallurgical, mechanical or physical properties, which are called welding discontinuities. Whether or not these discontinuities constitute a defect depends on the code of standards for the specific type of product. For example, only minimal discontinuities would be acceptable in a train because too many could put people’s lives at risk. On the other hand, a welder could get away with more discontinuities in a backyard gate. What Defects Can Occur With FCAW-S Welding? FCAW-S is not without its drawbacks. Smoke can billow up from the burning flux-cored wire electrode, making it difficult to see the weld pool. Porosity can result when a welder fails to properly setup the machine or manipulate the electrode. Below are some of the factors that can influence the number of discontinuities or defects that can occur when using the FCAW-S process. As is the case with other arc welding processes, problems can arise when applying the FCAW-S process. When your flux-cored wire electrode burns back and fuses onto your contact tip, you have a case of what’s called burnback on your hands. When this occurs, the arc is put out too soon. 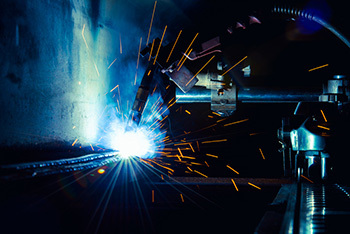 Burnback typically happens when the welder holds the gun too close to the work or feeds the electrode wire too slowly. The name says it all: when the electrode wire gets tanged in the wire feeding unit, it forms what looks like a bird nest. The tubular design of FCAW-S electrode wire makes it especially susceptible to compressing. If a welder selects the wrong type of drive roll, they could end up with a birdnest of welding wire. Poor tension in the drive roll, blockages in the liner, using the wrong type of liner or failing to properly trim liners can also result in birdnesting. One of the major pitfalls of FCAW-S, slag inclusion, a common welding mistake, occurs when tiny particles of flux become trapped in the weld metal, preventing the full penetration of the weld. Failing to remove rust, paint, grease, oil, dirt or moisture from the base metal before welding can cause porosity. Allowing the electrode to stick out too far past the contact tip can also cause this defect. Excessive voltage is specifically related to wormholes. When the weld metal hangs from the bottom side of the base metal, a welder has done much more than simply join the two metals. Such overkill is known as excessive weld penetration. The opposite can also happen. A light surface fusion between base and weld metal is known as a lack of weld penetration. Too much heat can cause excessive weld penetration, and too little can lead to shallow weld penetration. Cracks are the most damaging of the welding discontinuities listed in this post. Finished products with cracks in them are seldom acceptable. FCAW-S electrodes are meant for single pass welding only. Welders who attempt multiple passes could end up with cracks. Another cause of cracking is using steel plate that is too thick for the particular FCAW-S electrode. Welding students can refer to charts to help match the FCAW-S electrodes with steel plate of the appropriate thicknesses. Lastly, excessive current, expulsion and low force are some more general causes of cracks in welds. Use the right wire feed speed for the application and keep the contact tip no more than 1-1/4 inch from the work. Select V- or U-groove drive rolls for the wire feeder, and make sure the drive roll tension is correctly set. Routinely inspect your welding gun and cables for blockages in the liner. Keep liners trimmed in accordance with manufacturers’ specifications. Size liners correctly to the welding wire and diameter. Watch your travel and angle speeds. Going too slowly could cause the arc to trail the weld puddle, resulting in slag inclusions. Use the appropriate heat input. Follow manufacturers’ guidelines for wire diameter. Always clean base metals thoroughly prior to welding. Don’t allow the electrode to extend more than 1-1/4 inch beyond the contact tip. Never use too high of a voltage for your amperage and wire feed setting. Follow manufacturers’ recommendations for the diameter of the welding electrode. Limit the number of passes and choose steel plate of the appropriate thickness. Preheating is a general precaution that can be taken to prevent cracking as well. With so many applications and advantages of FCAW, mastering FCAW-S can be a valuable endeavor for welding students. Knowing the common pitfalls of the process and practicing it regularly can help welders-in-training prepare for positions in the field requiring precision and productivity.